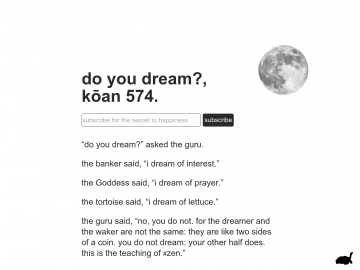 "Daily #zen koans featuring the guru"
Kōan of the Day is an ongoing series of #zen kōans featuring the guru, the tortoise, the sunflower, and many others. They inspire zenlightenment and provoke laughter. Kōan of the Day has not been tagged yet. Help others find Kōan of the Day by tagging it! Kōan of the Day has not been reviewed yet. Kōan of the Day has not been recommended yet.